Its not just a physical kind of rest Jesus is talking about here. (Taking a nice warm bath, or getting a massage can help with that for a little while.) Its REAL REST He’s talking about - the kind that comes from within - the kind that comes from sitting at the feet of Jesus and allowing HIM to carry our burdens. How often have you lost your self-control? How often have you yelled at your children for something they did wrong? How often have you raised your voice to your spouse because he/she wasn’t meeting your expectations? How often have you “chewed out” a friend over something that was rather unimportant? Losing your self-control in these ways is usually caused by being tired, stressed, overworked, and feeling unappreciated. I admit I am among those of you who have felt this way this past week; and I know ALL of us do at one point or another. It is a typical human response as we seek fulfilment from others, rather than from the Lord. Lorrie Flem of Eternal Encouragement Magazine, understands this. 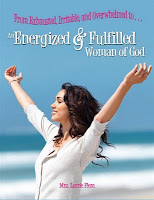 So, she felt led to produce a new product, specifically geared towards women, that helps us learn how to be more ENERGIZED AND FULFILLED WOMEN OF GOD. NOTE: This new product is not an e-book or an audio download. It is a physical DVD that is sent in the regular mail. The DVD also includes a PDF with a study guide that has the acronym of REAL REST on it. Lorrie uses the video and the study guide to walk us through how to find “real rest” when we are so worn down physically, emotionally, and spiritually. Lorrie helped remind me that sitting at the feet of Jesus is what will bring more rest for weary souls than anything else. She says, “You cannot be a nurturer unless you yourself are nurtured.” But, it’s a matter of choice. If we neglect Him, or don’t take the time to rest in His presence, our feelings of frustration and despair will get the best of us. So, what do YOU think would be the better choice? I love this old hymn that talks of this very thing (Click on the title below to hear the music). Disclaimer: I received Energized and Fulfilled Woman of God as an official member of THE GABBY MOMS blogging program for Eternal Encouragement Magazine. I received it free of charge, and all opinions are my own. Rest...I found out what true rest is this past weekend plus a day. Total...no tv, computer, minus texting (a bit with u), just the Lord, His Word, outdoors and my dh. Wow! As always, an excellent review! Thanks for sharing. Beautiful review! And with the sentimental touch from the hymn. Take care. I really like your review and how you pointed to scripture.